The middle run of Mushi-shi‘s second season takes both a darker turn and an upswing into more familiar territory. Episode five is the interesting tale of a woman who becomes tied to a mushi and must struggle for her sense of identity, but even this seems light in comparison to episode six. “Floral Delusion” is the darkest story yet, featuring a woman bereft of senses who has supposedly lived with a family for over eighty years, barely aging. The truth of her existence is at once heartbreaking and terrifying; it’s a definite must-see episode—just don’t expect to come away from it laughing. 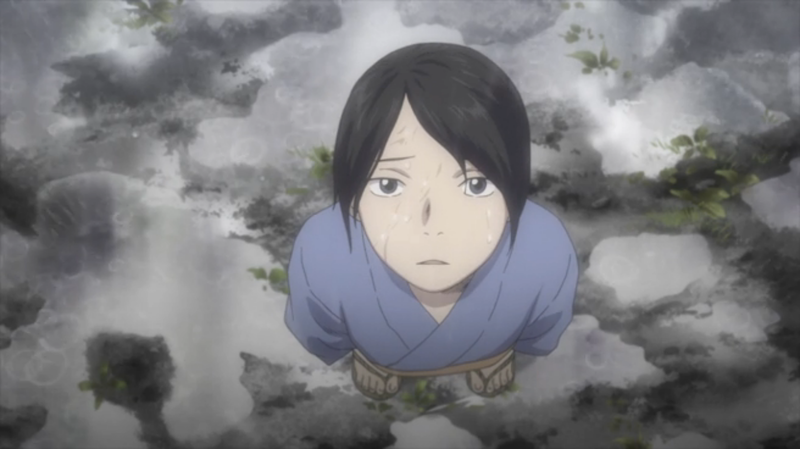 Episode seven was delayed by one week, but with its release came the appearance of a lighter, more familiar side of Mushi-shi. Back is the mushi’s framing as powerful but neutral forces of nature, and the life-or-death decisions that featured prominently in previous episodes are replaced by a feeling of coexistence and intentions of making the best of things. The featured character in this episode brings rain, but it isolates her—her story is one of companionship and understanding, a refreshing change of pace from mad botanists and malevolent mushi. I hope the lighter aspect of Mushi-shi has returned to stay; I prefer the positively-spun folktales to the darker, death-riddled tales of previous episodes. Otherwise, there isn’t much to report! Production values remain high for animation and sound, and the stories—while darker than what I’m used to—remain thought-provoking and entertaining.